Janet Pride by Dion Boucicault. The heroine was played by Mme. Céleste. "JANET PRIDE," AT THE ADELPHI THEATRE. The above new piece, by Mr. Dion Bourcicault, professes to be in three acts; but as it has two prologues, after the manner of the French stage, it is really in five; or, in other words, is a trilogy, like the Greek dramas, or Shakspeare's [sic] "Winter's Tale" and "Pericles." 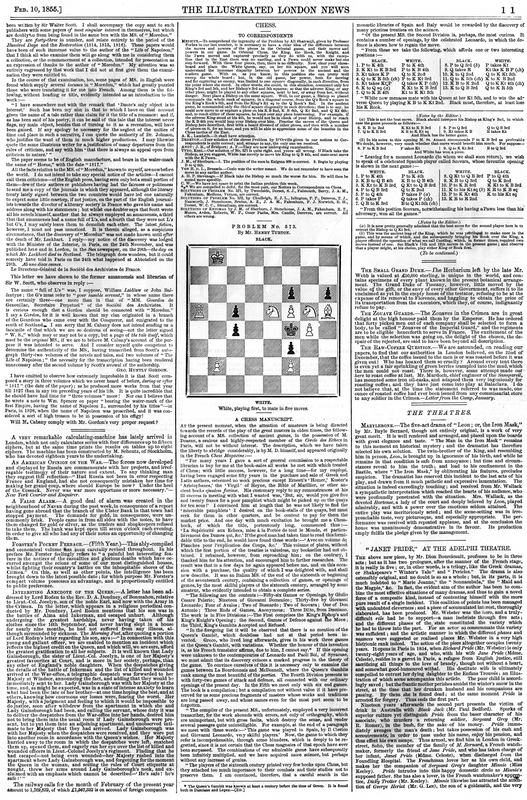 The drama is also ostensibly original and no doubt is so as a whole; but, in its parts, it is much indebted to "Marie Jeanne," the "Somnambula," the "Maid and the Magpie," &c. In fact, the evident aim of the author has been to combine the most effective situations of many dramas, and thus to gain a novel force of a composite kind, instead of contenting himself with the more pure result of a single incident. This coalition of points has been managed with undoubted cleverness; and a piece of accumulated interest, thoroughly elaborated, has been produced. Mr. Webster was the hero, and a truly-difficult role had he to support--a man inebriate through five acts; and the different phases of the state constituted the variety, which he had to throw into the part. For an actor so consummate this variety was sufficient; and the artistic manner in which the different phases and nuances were suggested or realised places Mr. Webster in a very high histrionic rank indeed. The action of the piece altogether occupies twenty years. It opens in Paris in 1834, when Richard Pride (Mr. Webster) is only twenty-eight years of age, and who, with his wife Jane Pride (Mdme. Celeste), resides in a garret in Paris, a refugee from English justice, still sacrificing all things to the love of brandy, though not without a heart and somewhat good-humoured withal. 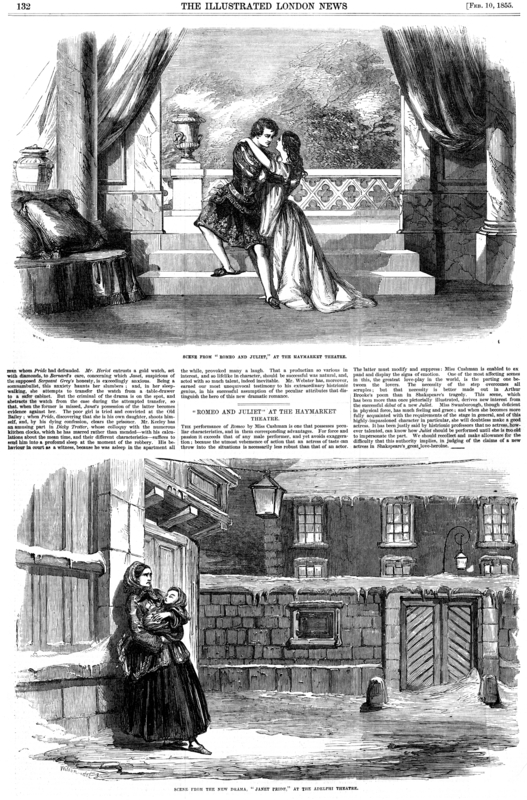 His destitute wife is ultimately compelled to entrust her dying daughter to the Enfans Trouvés; an illustration of which scene accompanies this article. 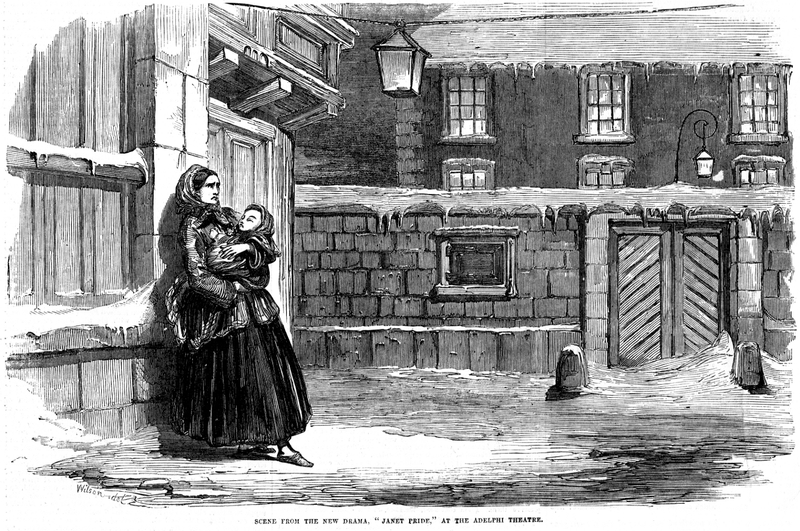 The poor child is accordingly saved; but the frantic mother perishes amidst the winter's snow in the street, at the time that her drunken husband and his companions are passing. By them, she is found dead; at the same moment, Pride is arrested for forgery. Thus ends the first part. Nineteen years afterwards, the second part presents the victim of drink in Australia with Black Jack (Mr. Paul Bedford). Sparks of superior culture yet distinguish Pride from the baser character of his associate, who murders a returning soldier, Sergeant Grey (Mr. R. Romer), in the bush, for the sake of his money. Pride immediately avenges the man's death; but takes possession of his cash and accoutrements, in order to pass under his name, enjoy his pension, and thus effect his own escape. Thus armed, we find him in London in Greek-street, Soho, the member of the family of M. Bernard, a French watch-maker, formerly the friend of Jane Pride, and who has taken charge of her infant, Janet Pride (Mdme. Celeste), when discharged from the Foundling Hospital. The Frenchman loves her as his own child, and makes her the companion of Sergeant Grey's daughter Minnie (Miss Keeley). Pride intrudes into this happy domestic circle as Minnie's supposed father. She has also a lover, in the French watchmaker's apprentice, Dicky Trotter (Mr. Keeley). Minnie likewise has attracted the attention of George Heriot (Mr. G. Lee), the son of a goldsmith, and the very man whom Pride had defrauded. Mr. Heriot entrusts a gold watch, set with diamonds, to Bernard's care, concerning which Janet, suspicious of the supposed Sergeant Grey's honesty, is exceedingly anxious. Being a somnambulist, this anxiety haunts her slumbers; and, in her sleepwalking, she attempts to transfer the watch from a table-drawer to a safer cabinet. But the criminal of the drama is on the spot, and abstracts the watch from the case during the attempted transfer, so that, when the former is missed, Janet's possession of the latter becomes evidence against her. The poor girl is tried and convicted at the Old Bailey; when Pride, discovering that she is his own daughter, shoots himself, and, by his dying confession, clears the prisoner. Mr. Keeley has an amusing part in Dicky Trotter, whose colloquy with the numerous kitchen clocks, which he has marred rather than mended--with his calculations about the mean time, and their different characteristics--suffices to send him into a profound sleep at the moment of the robbery. His behaviour in court as a witness, because he was asleep in the apartment all the while, provoked many a laugh. That a productian so various in interest, and so lifelike in character, should be successful was natural, and, acted with so much talent, indeed inevitable. Mr. Webster has, moreover, earned our most unequivocal testimony to his extraordinary histrionic genius, in his successful assumption of the peculiar attributes that distinguish the hero of this new dramatic romance.